One of my favorite classic hulas! It opens with the typical “Genoa Keawe” opening–steel guitar and her unmistakable strumming of the ʻukulele. The song has five verses and each one is rich with descriptive language–words that beg for a hula to illustrate them. 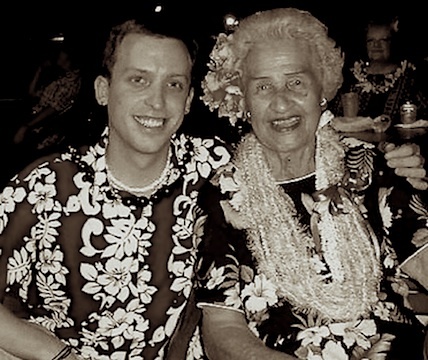 There’s a reason Aunty Genoa is considered to have “set the standard” when it comes to hula music. She’s simply one of the greatest. Ever. Wanna dance? This classic (and rascal!) hula will make you want to jump up out of your chair! The song seems to be describing the slipping and sliding and arching of the ʻoʻopu (goby fish). And wrestling a fish like that can be a lively thing, indeed. However… when I’ve heard the elders sing the song and seen them dance the hula, they indicate that there may be a more–well–”rascally” interpretation. I’ll let you listen to the words and decide for yourself. The Caz do an awesome job with this song. Master musicians to the max. And even though the song has been covered by so many artists, I can’t help but think of The Brothers Cazimero when someone mentions its name. *Please click HERE to visit the Brothers Cazimero’s page at Mountain Apple Company. There’s something special about a hula that opens with the sounds of piano, right? This song was written as a mele inoa or name song. A precious gift, indeed. According to the album’s liner notes, it was presented to Aunty Aileen Puaʻala Enos on her 70th birthday. Kainani’s rich voice and smooth delivery knocks my socks off. Classic and contemporary at the same time. Traditional and jazzy. And even if you don’t speak Hawaiian, I’ll wager you’ll be able to feel the spirit of Aloha that emanates from this beautiful song. *Please click HERE to visit Kainani’s website. The group, Olomana, is a favorite. And in this song, they’ve captured the sounds of the time (the late 70s) perfectly. It’s an English language song. Contemporary. Some might argue and say that it’s not a Hawaiian song but more of a pop song. Being that it’s done by Olomana, it’s Hawaiian to me. And there is that unmistakable-yet-impossible-to-describe “island sound” to it. When I first went to Molokai, I was singing in a kanikapila (jam session) with the amazing Kevin Brown. He asked me to sing another Hawaiian classic and then inserted this song–a verse of each at a time–making a medley. Right there on the spot. It was one of the most magical times of my musical life. Jamming with a Hawaiian legend. And making music on the spot. A moment that can never be repeated–but one that plays over and over in my mind. *Please click HERE to visit Olomana’s website. I’m hooked. It’s still on my list this week. Can’t stop listening! New Yorkers aren’t the only ones who feel stress. You get stressed out, too, right? 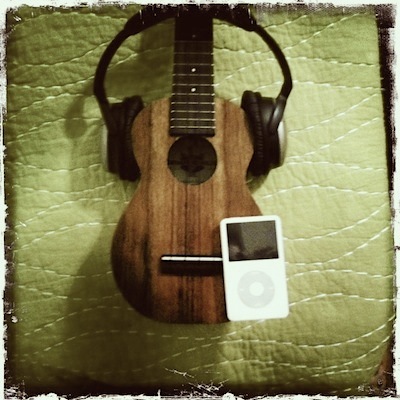 And when it’s played by an amazingly gifted and skilled musician like John Keawe… wow! This is one of those instrumental tracks where you are completely transported–the voice of the guitar tells the story. This track opens with the incomparable Braddah IZ telling the audience about the song and the story. And then he launches into it. So beautiful and so haunting. When I find myself ”down in the dumps,” I know surefire way to feel better: listen to an Aunty Genoa recording! Her joy–the joy of singing and sharing Hawaiian music–comes through so clearly! And her distinctive strumming style makes me grin from ear to ear. It’s instantly recognizable–even before she sings, you know it’s Aunty Genoa. Attributed to Aunty Lena Machado, this simple-to-strum (only 4 chords!) is a guaranteed crowd pleaser! *Please click HERE to visit Aunty Genoaʻs website. How much fun is this song?! Seriously, gang. Makes me grin from ear to ear. Attributed to John K. Almeida, this song lives up to it’s name–IT SWINGS! And with a voice like Aunty Leinaʻalas, how can you go wrong? Another song that should be a part of every Hawaiian crooner’s repertoire. When I’m in need of a great 70′s vibe, I turn to Kalapana. Yup. They rock my world. And this song makes me feel like I’m riding around in big ol’ car with the windows rolled down and warm summer wind blowing in my face. Chris Yeaton has such a magical touch on the guitar. The sound of sunshine, I think. Like the sound of light making dancing rings on the water. And this classic song gets a royal treatment, Yeaton-style! I think he’s an amazing musician. And an amazingly cool guy, too. *Please click HERE to visit Chris’ page on the Woodsong Acoustics Group site.